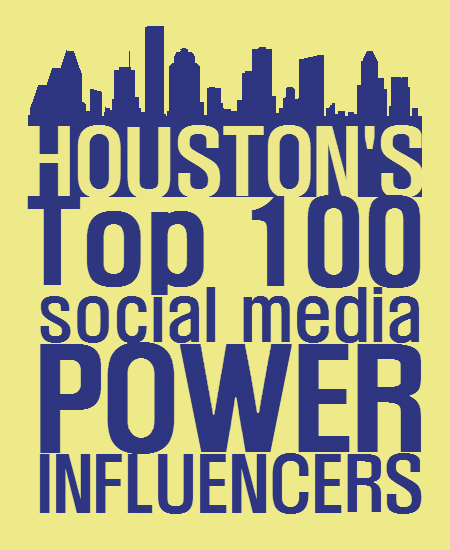 For this ranking, I found every Twitter handle that mentioned Social Media in their bios and was located in or near Houston – about 250 total. I added folks from LinkedIn near Houston with “Social Media” in their job titles. Finally I took to Twitter to ask people for their personal suggestions, increasing the total list to about 350. I then took out any accounts belonging to businesses or agencies, or those belonging to people who weren’t focused on Social, reducing the list back down to 150. I fed these all into Peek Analytics and got the top 100. Great list and fantastic work explaining the purpose and the methodology. You did leave someone off the list though. He’s a big part of the community and has even been mentioned on Forbes! This post was all about community, networking and providing value back to the Houston Social Media community. Most definitely not about me! Eric, thanks for including me on your list. Nice catch Dwight. Seems that if the “http://” is left off, WordPress seems to want to replace it with ericttung.com. Will update these all after work…! Also, linked to the blog as well under “Houston Chronicle” in your description. The list was a list of influencers on the subject of social media. Mayors, politicians, sports stars, megachurch pastors have lots of influence, just not about social! Fair enough! Congrats again on a neat list. I’m just perplexed since I seem to meet most of the qualifications. Thanks for the Peek Analytics link – I’m generating my user report now. Thanks so much, Eric – really honored to be included on this list. I love that our city is home to so many social, savvy and brilliant minds / Twitter accounts. Cheers! Yes – and that was the main purpose of the list. Get folks recognized and networked! Sad not to make it on your list of cool kids but cool to see so many familiar names and friends on the list. My report gave me a pull of 50x.. lol. Yes – see reply on 51-100 post. Sorry for the oversight. Thanks for pulling the list together, Eric! Houston is chock-full of social talent, for sure. Glad to have you be a part Abi. Thanks! Great list! Hope to make it on there one day! Hey Scylla – include your Twitter handle and I’ll add it to the report next time to see! There were many that almost made it! Proud to be a part of such a diverse and incredible community in Houston; thanks for shining the spotlight on how much we’ve grown, Eric! Thanks for connecting Jamie, and thanks for your comments. That really was the whole idea. Get people talking, get people interested and show people who we are! That’s Eric! I’m Honored and humbled to be included among so many awesome people! Eric thank you for putting this list together and recognizing the talent in Houston. Most importantly thank you for getting us all networking with one another. I am honored! Shouldn’t be a surprise… You know EVERYONE! Is there a Meet Up in the Works? I would love to host it at my office @askportia @we_do_itBG #socialmedia ROCKS! Thanks for finding me Eric! I have been exploring for a little bit for any high-quality articles or blog posts on this kind of area . Exploring in Yahoo I at last stumbled upon this site. Reading this information So i’m happy to convey that I’ve a very good uncanny feeling I discovered exactly what I needed. I most certainly will make certain to don’t forget this web site and give it a look on a constant basis.